It’s been an interesting week in Canadian politics. I’ve fallen a little behind with my own analysis of the election that happened two days ago now. In my defence, I, unlike Stephen Harper, don’t mind having a drink or two or more. When the CBC declared Elizabeth May elected in Saanich-Gulf Islands, the champagne (ok, the “Baby Duck”) flowed freely at the Sudbury campaign office. Most of it seemed to flow directly into my belly. Now, although foresight is something that I’ve been accused of not exactly being blessed with (as some of you more constant readers of my blog have surely discovered – not that it stops my prognosticating), I had booked the Tuesday off from work, just in case things got a little out of hand on Monday night. Which, for me at least, they did. Although it’s far from certain whether I was drinking in celebration of Elizabeth May’s historic win in SGI, or drinking to dull my mind about the prospect of a false majority government for the Conservatives. In retrospect, I think that I am more concerned and upset about the latter than I am happy about the former. I seem to recall comments made by May herself back in 2008 that the last thing that she wanted was to have a handful of Green MP’s elected to stare across the aisle at a Harper majority. But perhaps I shouldn’t bring those comments up. Despite the other historic upsets which saw a record number of NDP MP’s elected to the House, and the virtual destruction of the Bloc Quebecois, Monday’s election has left me very concerned about the future economic health of our country. Although a minority of voters (around 40%) gave the Conservatives a nod, the fact is that with a false majority, the Cons will be free to pursue their corporatist agenda to, what I suspect will be, the detriment of a majority of Canadians. Four years is a long time; a lot of change can happen in those years. Most of the changes we’ll see, I suspect, won’t be the sorts of changes which Canada needs to make in order to be better positioned to face the future. Almost certainly we’re not going to see any action to put a price on carbon in order to combat the climate crisis. Our role in international negotiations will undoubtedly remain obstructionist, at best, and completely undermining at worse. In an effort to pretend to be doing something about the climate crisis, and meeting their extremely modest emissions “reduction” targets (which aren’t actually targets to reduce emissions), the Conservatives may wish to continue pursuing the “one offs”, such as the recently announced carbon capture and storage project in Saskatchewan, in an effort to convince voters that they’re doing something. Unfortunately, more projects like this one, which (may) reduce carbon emissions, will end up bankrupting our economy due to a massively high price per-tonne of CO2 removed. Megaprojects aren’t the way forward for emissions reductions, when conservation is a cheap and viable alternative. But I guess conservation doesn’t line any corporate pockets. With four years of a false majority government taking little or no action on the climate crisis, you’d think that a Green like me might be happy that my party could emerge to fill a void on neglected environmental issues. That seems sensible enough, on the one hand. If Canadians, in 2015, want to see action on the environment, maybe in the same way they did in 2008, or perhaps in a stronger way, turning to the Green Party will make sense. Right? The Liberal Party is going to have to try to figure out a way to rebuild itself after the disastrous result handed to Michael Ignatieff. Surely one of the ways forward for the Liberals is the need to define themselves as a Party of bold ideas, and not just the “We’re not the Conservatives” which so many Canadians obviously grew tired of hearing. When it comes to bold ideas, the Liberals are going to have to latch on to the environment as a starting point in a conversation they’ll have with Canadians. Only this time, under bright and articulate leadership (whether that’s Trudeau, Rae or Leblanc, or…dare I say it? Stephane Dion), they’ll be able to make the issue of the environment and climate change their own. In 2008, they tried this approach and failed. Perhaps the timing wasn’t as auspicious as it might have been; perhaps the messenger wasn’t able to communicate the message effectively. Whatever the reason, the outcome led to the Liberals abandoning their carbon tax plan, and embracing an expensive, untested, and problematic cap and trade scheme which no one wanted to talk about. The fact that the NDP and Bloc also supported cap and trade in this past election meant that carbon pricing was left completely out of the (meagre) policy debates which took place. Yet, back at the Liberals’ policy and leadership convention in the spring of 2009, the Liberal Party membership reconfirmed their commitment to a carbon tax. Famously, Michael Ignatieff at the same convention went on the record that he would not be running on a carbon tax. Now that he’s gone, the doorway remains open for the Liberals to bring back carbon tax shifting policies, which would be very similar to those promoted by the Green Party (except for the price per tonne charged, which under Dion would have been much lower than the Green’s pricing; and on the flipside, the Liberals would have given you less of your money back than the Greens would have too). It is almost inevitable that the Liberals will find themselves in this position four years from now. I say “almost” because there really appears to be only one thing which could derail the Liberals from developing a platform which takes a visionary and comprehensive approach on addressing the climate crisis. That “one thing” is if the NDP get there first. The NDP has been talking a little bit more lately about climate change, but it’s apparent to me that the New Democrats still just don’t get it. In this past campaign, we saw the NDP talk about the need to reduce carbon emissions, and then with the very next breath, they told voters about their desire to lower the price of gasoline, because people need to get to work. At the end of it all, the NDP’s primary focus has been (and likely will continue to be) putting the working class at the front of the line. Generally, I share those concerns with the NDP, but when it leads to inaction or detrimental action on environmental initiatives, we’ve got a problem. Because no matter how much we need good jobs for working families, if we don’t get the climate crisis under control, jobs (good or otherwise) are going to increasingly become a scarce commodity. The NDP’s support of cap and trade illustrates their lack of understanding regarding climate change, or the needs of small businesses. A fluctuating price on carbon will put businesses at a disadvantage when it comes to figuring out medium and long term expenses. In contrast, a carbon tax is a known quantity, and businesses will be able to plan for expenses. Larger, international corporations doing business in Canada will be better positioned to handle a fluctuating carbon market in a cap and trade scenario; it will be the smaller businesses which will run the greatest risk from a fluctuating market. Since those are the same business which Jack Layton and the NDP claim now to be the champion of, it perplexes me to no end that the NDP should continue to support cap and trade over a direct tax. But that’s exactly the sort of contradiction that I’ve come to expect from the NDP, and in part why I just can not support them. So I don’t really think that the NDP will have altered their cap and trade stance four years from now, but it is possible, and if they do, they will steal some of the Liberal’s thunder should the federal Liberals decide to go down that road (and for the reasons I’ve identified, I really do believe that they will). Four years hence, I have to ask myself, which Party is going to be in the best position to deliver on the environment and the economy? Clearly it won’t be the Conservatives, and I doubt it will be the NDP. That leaves…the Greens and the Liberals. And four years from now, there might not be much of a Green Party left, save and except for a rump around Vancouver-Victoria, and maybe an island in Central Ontario. You see, this election hit the Green Party hard. Yes, Elizabeth May became the first-ever Green elected to parliament, which is a huge accomplishment. I was an advocate of the “putting all of the eggs into one basket” approach to get May elected, developed as the top priority in the Party’s campaign plan. I figured that if May was elected, our Party would have renewed credibility. I suspect that’s going to still be the outcome, but how far will that credibility stretch in the current circumstance? Aside from May’s election to parliament, what happened to the Green Party on Monday night is going to reverberate throughout the Party in the years to come. Our percentage of the popular vote declined to levels not seen since before Jim Harris was the leader. This might have had to do more with the fact that May was excluded from the Leader’s debate, which shot the Party’s credibility all to hell. At the time, May said that she didn’t see it coming, and that she expected to be included because of what happened last time. Whether this was an unexpected revelation or not, the Party had a decent contingency in place to work the mainstream media and social media to keep the story alive in an effort to change the Consortium’s mind. I can tell you that her exclusion from the Leader’s debate came as no surprise to me. And four years hence, her exclusion from the Leader’s debate will continue to be unsurprising. I have every confidence that the Conservatives will begin assessing minor electoral reforms, and one of those initiatives will be to codify who gets invited to televised debates. In an effort to keep the Bloc out of those debates, a threshold will be set, and it will be the Leaders of Parties which have Official status in the House. This means no Bloc and no Greens. The other parties, in a rare display of agreement, are sure to endorse this approach. 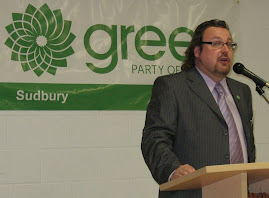 Why would the Liberals and NDP want the Greens at their debate? They had the opportunity to influence matters in this past campaign and chose to sit on their hands while idly mouthing that they thought the decision should have been different. Thanks for using all of your influence to walk the talk there guys. May’s impact in the House is going to be marginal, whether she can convince the Speaker to authorize special privileges or not. She’s one voice, and she’s up against a majority government. On many of the things which she might speak about, she’s going to end up sounding no different than her NDP and Liberal counterparts. Sure, she may yet wind up to be the moral conscious of the House, but in our win at all cost electoral system, having a moral conscious is almost a sure guarantee that you won’t be returned to the House. And that maybe most of all is why I’m feeling empty after this past campaign. What we have done is return to power a Party which was found to be in contempt of parliament, who have proven themselves to be the most secretive and power-seeking political party Canada has ever seen. Just about everything that I value about our democratic institutions and traditions, the Conservatives are willing to sacrifice on their alter of political expediency if they think there’s gain to be had by doing so. Yet we’ve rewarded the Conservatives with another chance to govern; in fact, we’ve given them a big blank cheque to make over our nation as they see fit. Why did we just do that? I’m not going to blame the NDP surge for vote-splitting in the GTA, or the hapless Ignatieff campaign that couldn’t find an issue to stick to. I’m not going to blame the Green Party for mounting a dismal national campaign at a time which we could have seized on the zeitgeist of the moment (had we only known that the moment was upon us; no blame for us Greens here, as no one knew that the moment had come a few weeks ago, until a few days after it had happened). Heck, I’m not even going to blame the pollsters who largely blew making the call. The votes were cast and counted, and although Canada did not get the government that it voted for, it got what it got, thanks to an antiquated electoral system where most votes simply don’t matter. 60% of voters wanted a Party other than the Conservatives, yet here we are with a Harper majority. Almost 40% of Canadian voters remain disengaged from our electoral process altogether, which remains one of the saddest stories to come out of this election. The rise of the NDP hurt the Green Party in this election. In a majority situation, the NDP will have plenty of time to consolidate, and by staying in the spotlight for four years, we can expect that the NDP won’t be just experiencing an “ADQ moment” and dissolve back into the background. With an NDP positioned to champion the left, and with a Liberal Party offering something akin to a bold vision for Canadians, where might that leave the Green Party four years from now? With our electoral defeat, our funding from the per-vote subsidy has been cut in half overnight. With the Conservatives threatening to remove the subsidy altogether, we can expect that funding to dry up in a few years. While it’s true that we’ve been getting better at fundraising, with a loss of votes throughout Canada, our pool of well-heeled supporters is drying up. Perhaps May can re-invigorate the Party, when she’s not busy in Ottawa or doing constituency work or just generally being Wonder Woman. I guess we can add fundraising to her list of things to do. Without the money in the bank, we can expect a similar national campaign to the one we’ve just been through. Over the past several years, we’ve decided to make May’s election the top priority, at the expense of almost every other initiative we might have undertaken. It’s beginning to show. Last year, dozens of EDA’s were deregistered, while none were created to replace them. EDA’s are the local, grassroots heart of the party, yet they’ve been neglected by the Central Party at the expense of our campaign strategy. Without immediate focus on building healthy EDA’s, we can expect many more to whither, especially with such low numbers of supporters. Here in Sudbury, we’ve grown somewhat used to have to compete with the NDP for progressive votes; now, we’ve just seen that applied to all of Canada. And we can expect it to continue, unless something is done about it. This past election rewarded the politics of cynicism over the politics of hope, despite what the NDP surge might have you believe. The Green Party clearly didn’t engage on a cynical level (or, pretty much on any level, due to the lack of media coverage). Our hopeful voters left us in droves, casting their ballots for orange (just as progressive Liberals flew the coup as well). In the future, if we are going to experience success, we will need to define ourselves in stark contrast to the NDP while also successfully communicating that message. For too long now, in the minds of voters, there’s been a great degree of confusion about our Party and the NDP, given the plurality of issues which our two parties appear to support. Perhaps its time to take aim at the NDP’s policies which are problematic for our supporters, and engage in a degree of “negative campaigning” about the issues (and not about the personalities). We may have to use some of our limited media exposure to go after the NDP, in order to define ourselves as something “other”. In this past campaign, the confusion between small “g” green issues which our Party supported and the NDP did as well led directly to our supporters casting their ballot for a different Party. This kind of messaging won’t go over well with the Green Party. May has already said that she is going to practice politics differently. That’s likely not going to be good enough for the Green Party in the face of a successful NDP Official Opposition. And make no mistake, the NDP will be successful, because they are the anti-Conservatives. With only a Liberal rump in place which doesn’t have a clue how to conduct itself as a third party, and which will be focussed on internal issues for a couple of years now anyway, the NDP under a cagey and canny Laton will have it good. Which is bad for the Greens. Other options might need to be explored, especially if members and past-candidates begin jumping ship again, demoralized by our efforts in the election, despite May’s inclusion in parliament. Unless those members can be replaced, it may come to a point where the Green Party is going to have to seriously look at opportunities for a merger, although in our case, it would be more like being subsumed by one of the other Parties. A rejuvenated Liberal Party might provide for a good partner for Greens in the years to come, if they truly begin to embrace a bold vision for Canada. Alternatively, the Green Party could simply bleed away into a regional or multi-regional party, with vast areas of the nation having given up and moved on – for now, with the hopes of being recaptured when a more mature Party emerges. Either way, in the current circumstance, there must be a change of focus within the Green Party. We may have to return to our grassroots, although I don’t think that electoral success lies in that direction (plus, with May as Leader, along with our current Federal Council, additional power flowing to the grassroots just isn’t going to be on the table). Therefore, we must become like the other parties, only without the money or staff. That’s…a pretty big challenge. There may be a third way, however, and that’s to focus on only those things which we can accomplish. One strategy might find us centring our scarce resources on winnable ridings geographically grouped together at the expense of everybody and everywhere else, perhaps as a part of an agreement with other parties not to run against them. This kind of “strategic merger”, potentially again with the Liberals, could further our interests, especially if we target Central Ontario and parts of BC (and maybe Alberta, although I’d be reluctant to waste too much time there) where the Liberals currently don’t have seats. And finally, we should be ready to create our own opportunities when the moment arises. That means fully participating in by-elections (in ways we haven’t done so in years now), and running smart media and social media campaigns which are issue-specific. We need to use the mainstream media to target Canadians about the big issues relevant to our Party, and use social media for micro-campaigns which distinguish us from our NDP rivals. All of this will require planning and organizing. I’m just not sure that we’re going to have the resources to pull it off. Those…are my thoughts, two days after the 2011 federal election. I do truly enjoy reading your blogs as an opinion different from mine but I do have to question the comment on "False Majority". What do you consider a true majority? When Chretien won his majorities, he had less than what Stephen Harper got this election in terms of popular vote. If you exclude Quebec, then Harper got over 50% of the voting public. By the same account 96% of the voters did not want the Greens this election. What do those numbers mean? Part of the issue is that previous Green voters (about 360k) no longer parked their vote with the Greens and instead parked it with the NDP. The historic collapse of the Liberal party did not help but really the voters (well those that did vote) decided that they would prefer the Conservatives over the rest of the party. I question the commitment of the Green vote when close to 40% of the people that previously voted Green moved onto other parties. I do believe that while the Green's have a good message, most of the previous votes received in the past election were protest votes as opposed to true votes for the party and the message. You can say that the debates were the reason for the loss but I would say the refusal to leave BC by May was a bigger reason. When you leave all your eggs in one basket, don't be surprised when you only have one egg. While you make question the false majority, at the end of the day, the Conservatives won in every province and 2/3 territories. That mandate seems pretty clear and I believe that the next 4 years will be interesting (just not sure if that's interesting good or interesting bad). The assumption is that the Conservatives will spend the next 4 years highlighting why people should vote for them in 4 years and they may either get that wish or tank like they did at the end of the Mulroney years. That almost surely depends on whether or not you get a charismatic leader from another party rise up to the occasion and drive hope. Unfortunately the Liberals have no one so far and May really isn't that leader. It's no wonder people voted for Jack (and they really did vote for him as opposed to the various candidates running in each riding). One other comment, what is more undemocratic, having a government win a majority with 40% of the vote or suggesting that other parties don't run in a riding to try to win? Of all things that people hate, it's the colluding that goes on in the left. This is another reason why people don't trust politicians. If you want to merge the left, then go merge the left. Don't try to sneak your way in by getting other parties not to run against you. You will be no better than the rest. May it's time for the Greens to work their way east from BC rather that trying to drink from the firehose that is Canada. If you look at it, this is essentially how Harper won this time around. Started in Alberta and worked his way out. It only took 10 years. Unlike us, I don't think most people will over think what happened to our pop vote making in very important we hard sell that Greens are now electable. We should be issuing local press releases now promoting the win and pledging our intent to replicate this success in other parts of Canada. SGI should gain us a moderate new base of members and donations, IF May does the leg work required to visit ridings this summer, while our victory is still fresh. How do we prompt this action from Elizabeth? 1. full competitive campaigns in additional ridings chosen by polling, local fund raising and EDA executive/volunteer strength. The mothership must pledge to directly support additional targeted ridings with Mays presence over the next 4 year and to put on a smattering of full campaigns. The rest of us will continue to fight the good fight just like Liberals in Alberta do. 2. 308 candidates- we came close but we should not be scrambling up until the nomination date in an attempt to run a full slate. Candidates need training and face time with the public. 3. begin to recover or spawn new EdAs. The Prov organizers now have 4 years with no fear of election to actually organize. Existing EDAs should reach out to their neighbors to mentor new organizations. Locally, if the existing candidates were good candidates those EDAs need to immediately plan their AGM and nominations. We cannot be seen as inactive for the 4 year interval and must put a face to the local Green franchise. If a bunch of these could be planned to coincided with a May tour that would be all the better. Its a big commitment but we need candidates to be full time, make their presence known with input to and commentary on municipal issues, sit in on councils, present our perspective on local issues etc. Like good MPs , MPPs, MLAs and councilors our Candidates need to be seen and seen often and if that means the EDA buys charity tickets or chamber of commerce memberships then so be it. In some cases this will actually promote micro fund raising. Tell our membership that a Chamber membership can get our message to local business leaders for the low cost of ______ and people will step up because they see how the money is being used. Money for a purpose is much easier to ask for and more likely to succeed than vague pleas to fill our war chest. EDA's need to take lessons from the municipal schmoozers who start their council runs 2-3 years out. Since a riding is much bigger than most wards we need the entire 4 years. I agree we need to target NDP policy but we really should reach out and give moral support to the newbie MPs. I don't believe Jack will be able to handle the complexity of the Quebec situation with 50 new MPs , some of these people will be evicted or crossing the floor before the term is up, snagging a Quebec seat would be a huge coup. May did leave the province twice for about 8 days I believe. That the press refused to cover her is not really her fault. More than usual in this election the press made the news rather than report it. Popular vote and seat totals for the province of Saskatchewan. Harper's false majority is less glaring than this warped result in Sask but it's not nearly proportional to his popular support nor fair. Its like gore losing to bush yet having higher popular vote, the same has happened in one of the Atlantic provinces where the party with higher pop vote won less seats. We need a system that addresses these imbalances. While the concept of PR is a noble one, the implementation of such a system would be rife with cronyism. For example, if we went with the Sask numbers, the Conservatives would get 8 seats, the NDP would get 5 and the Liberals 1. That of course is just based on the number of people that voted (about 60% I guess). So the hard question would be who decides who those people are? What if the NDP decided to select 5 people that only represent Regina? Is that fair? Are we at the point where ridings no longer matter and regional representation is an afterthought? Who would you go to if you lived in Prince Albert? How do we even know which people are running in Sask or should we just rely on the party choosing the right people after the vote is done? I'm hoping that PR is not the only reason why you would favour one party over another. At the end of the day, we need stewardship in all of the areas of federal responsibility including world events. PR for most people doesn't even register as a major reason to to vote for one party over another. It's the other areas that we should be concerned with. As for the Bush/Gore vote issue. That's an easy argument since they only have 2 parties. If we had two parties,I'm sure we could make the same argument but hearing people say that 40% popular vote means 60% voted against you is just bad math. I would submit that smart parties would allow members to rank potential MPs 1 member/1 vote. This would lessen cronyism to a point and would also get rid of unqualified cardboard cut outs like the NDP Quebec caucus. The point is however only a tiny percent of people belong to a party, even less vote in their candidate nominations and parties interfere or parachute candidates into EDAs. Cronyism is already rampant, I don't see it getting any worse with PR. It might actually drive membership up to thwart abuse. parties could also create systems that weight the slate to equalize regions, genders etc. Those parties that do a bad job of creating representative slates will pay at the ballot box and in memberships. STV would give me a choice of regional reps to interact with, I'd like that. Since most people can't name their rep let alone bother to interact with them, and certainly most don't vote local for the local candidate rather they vote for a leader I don't believe this is really a major concern. The MPP however would balance both needs for proportional and direct rep.
And no, PR was not the deciding point but it was factor, without a fair democracy I don't believe you can get good government. I believe more voices = more ideas = better decisons. I would not for example support the scorched earth policies of the Cons just to get PR. The greens started with some good ideas, PR and the environment among them and have fleshed it out into a vision I can largely embrace. If the greens here were as socialist as their European brethren that too may have turned me off. @Dave S: the term “false majority” isn’t mine; I think it comes originally from Canadian constitutional expert Peter Russell, but it’s widely accepted as part of the political vocabulary, used to describe a circumstance where a political party receives an opportunity to govern in a majority circumstance without having received a majority of the popular vote. In this case, the Conservatives received roughly 40% of the popular vote, meaning that just over 60% of voters didn’t cast ballots for that Party. Despite only receiving the largest minority of the popular vote, the Conservatives are able to govern in a majority circumstance. How is this different from the “majorities” received by Chretien? It’s not at all different; Chretien too governed in a false majority circumstance. I’m not sure about the point you’re trying to make by eliminating the Quebec vote from the equation; an equally valid point would be removing Alberta’s vote from the equation, but neither really makes sense in a national context. I appreciate your comments about May’s lack of a national campaign as one explanation as to why the Green vote collapsed (and “collapse” it did; we lost the biggest percentage of the vote of any party in this past election, bigger than the Liberals or the Bloc), and I appreciate that a certain percentage of votes cast in the last election were undoubtedly protest votes. “Soft” support of our Party has always been a concern. And I think we saw that on Monday night. However, if this election proved any points (and I’m not saying it did, because there will always be specific on-the-ground circumstances which defy the rules), this is one of them: local campaigns just don’t matter as much any more. With the focus on Leader-driven national campaigns, it was shown in this past election how candidates who aren’t showing up for debates, or whom are on vacation, can still win. Of course the exception to this rule may appear to be May’s win, where hundreds of volunteers were organized in SGI to identify and get out the vote. Pouring a lot of pre-writ money into the riding didn’t hurt either, I’m sure. So with that in mind, I still think her exclusion from the debate and the late NDP surge, along with soft support which hadn’t been nurtured since 2008, were the biggest factors in the collapse of the Green vote. I don’t think many in the Party were surprised by the loss of popular vote, especially after the msm chose to exclude May and then ignore her, but I think that there are many who are still stunned by the depth of the loss. However, our Party has invested little in organizing over the past several years, and we’ve lost a lot of local associations which would otherwise be working at the grassroots to promote the Party (and many more EDA’s exist largely on paper only). Your comments are always appreciated, even though we disagree more often than not. Just reading through the other comments now, and I’m seeing a good discussion. Carter, I like the way that you’re thinking about planning and organizing, and I agree with the notion of getting May out in front of the EDA’s as part of a rebuilding exercise. I also like the notion of looking for floor-crossers, potentially in the NDP ranks, but I think that Dave’s question regarding where are Party actually stands on Quebec is relevant. It’s my impression that we’ve not specifically paid a lot of attention to the Canada-Quebec relationship, opting instead to focus on a very national (read: “federalist”) perspective almost as a default. Certainly our position on Canada-Quebec is not nearly as nuanced as the NDP’s, for example, or perhaps even the Conservative Party’s. Nonetheless, we’ve shown in the past that we’re not reluctant to take in anybody in parliament who’s been looking for a seat. Blair Wilson was hardly a great catch, but I know that I had a drink the night I heard he had joined the Party. But, I don’t know that our Party is going to be the “go to” party for anyone in the near future, floor crossers or financial supporters. I appreciate though that I may be over-reacting based on the loss of popular support, rather than focusing on the upside of electing an MP. It’s fair to say that my opinion is tainted by my bias, and what I saw happen here in Sudbury and Nickel Belt has certainly left an impression. Both ridings had great candidates, which received a lot of positive media attention. The campaign in Sudbury was particularly edifying, except for the lack of volunteers and our inability to find real live supporters to help with the campaign. We had money in the bank, though, and spent a very modest amount. We had signs up all over the community, and were active on FB and Twitter. The NDP was certainly making a heavy play for our votes, though, and ultimately it appears that their tactics paid off. Expectations were high here that we would reach 10%. I was less certain of success, especially after May was excluded from the debates and that national campaign was ignored. Still, there were those in the media and in other parties who predicted a robust vote for our candidate. It didn’t materialize. Our supporters fled the Party, and largely embraced the NDP incumbent who, admittedly, is a hell of a good guy. But even his numbers appear to have been inflated by something….like Liberal collapse and the national NDP surge. He won 50% of the popular vote. Clearly, it wasn’t just Green supporters which went to him. Nickel Belt was a similar story, only the candidate there had no money and relied primarily on an e-campaign and the media to get her message out (which she did as effectively as she could have). I think Dave’s point about picking an area and resonating outwards, such as the Reform/Conservatives did with Alberta, might have some merit, especially given the current conditions of Green support in parts of the country (here I’m thinking Toronto and Atlantic Canada). Non-compete ridings with other parties might also be something worth considering, for strategic circumstances and as long as those parties share similar or complimentary policies. I’d argue that the NDP, which fights its battles from the left of the political spectrum, isn’t one of those compatible parties, despite its stated desire for PR.